Here at CharityCAN we know how important relationships are to fundraising. Donors want to be connected to your mission and your organization. Strong relationships can make all the difference, and prospect research can help to find and cultivate those relationships. 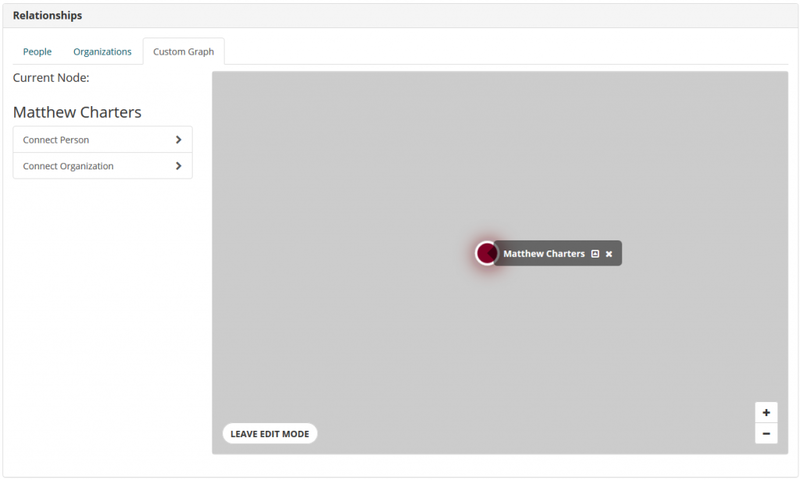 That’s the reason we’re so excited to announce our newest feature: custom relationship maps. In the past, CharityCAN has been able to show you connections between people and organizations based on an individuals’ time spent in a board position. We also made those connections searchable with our relationship path search. While board positions are easy to find and verify, they only barely scratch the surface of how a person might be connected to another person or organization: what about that major donor who isn’t on your board but you know has been a long-time supporter? What about your prospect’s business partner, or their law school classmate? We haven’t been able to fully tap into a prospect’s inner circle until now. Now on any saved prospect profile, you’ll find a Custom Graph tab that will let you build a new, completely customized relationship map from the ground up. Starting with your prospect, you can add relationships to any organization or person in CharityCAN, along with the strength of that relationship. Then you can add connections to those connections, and on, and on, and on! We’ll suggest connections based on relationships that are already in our database, or you can strike out on your own, creating completely new ones. The best part of these maps is that any new relationships you add to a custom map are instantly available for you in our relationship path search and our other relationship maps so you can make use of all your hard work. We’ve also worked hard to ensure that your data is only your data. 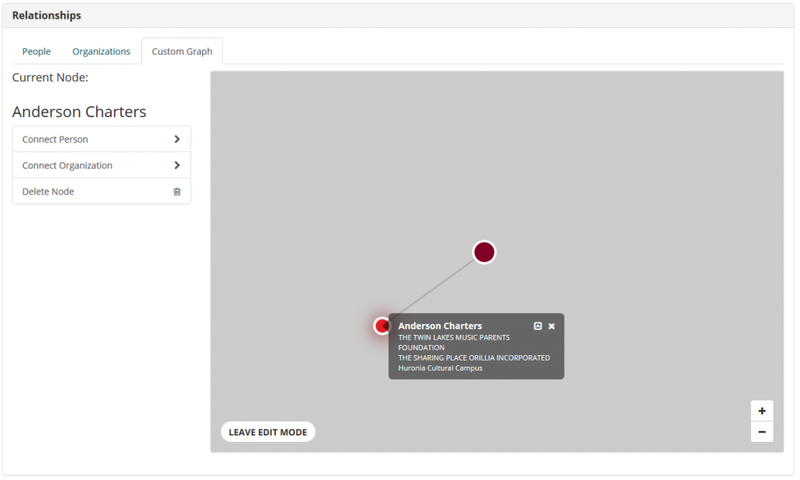 Any new relationships you create in a custom graph are visible only inside your organization, including any new paths created for your relationship path searches. We hope that you find this new feature as exciting and powerful as we do. If you’d like a quick demonstration or if you have any questions, please get in touch! The ability to set a default organization is a new feature in CharityCAN that impacts both the prospect profile builder and relationship path searches. In this short guide, you will learn how to set a default organization and a few ways it can help you use CharityCAN more effectively. How do I set a default organization? Go to My Prospect Profiles and on the right side of the screen select Select Default Organization. Type in the name of any registered charity or profiled corporation to set it as your default organization. You will notice a list of suggested prospects will populate. Cool and super interesting right? I agree. More on this later. Go to Relationship Paths and type in the name of any registered charity or profiled corporation to set it as your default organization. Okay, I’ve set a default organization. Now what? Now that you’ve set a default organization you will notice My Prospect Profiles looks a little different. 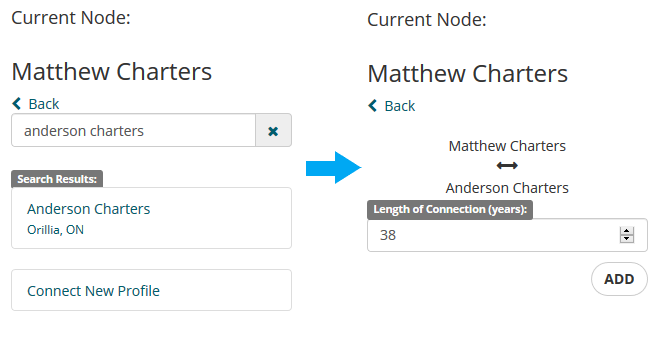 Setting a default organization allows CharityCAN to suggest potentially interesting prospect profiles to you based on the strength of the connection to your default organization. If you are looking for new people to add to your pipeline, setting your organization as the default organization and looking through the profiles CharityCAN pushes to you is an awesome place to start. Alternatively, you could set a granting foundation or corporate sponsor who has been a major friend to your organization as the default organization. CharityCAN will then suggest a list of profile with connections to the granting foundation or corporate sponsor. Once an organization has been set as the default organization it will auto-populate in the from section of all relationship path searches. Although the majority of giving in Canada is done by individual donors, charitable foundations are an important source of funding all Canadian fundraising organizations should consider. In this guide, you will learn how to use CharityCAN to effectively research, qualify, and connect with charitable foundations. First, we need to qualify a foundation as a prospect. If you are looking for a brand-new donor, head over to donation records and search for a foundation that has given to your cause in the past, in a dollar range that fits your parameters. If you already know the name of the foundation you would like to research, go to Integrated Search and select the Organization tab. Entering the name of the foundation in this search field, will return all of the information CharityCAN has on the foundation. From here, you can take a quick look at donation records and ZoomInfo contact information. For comprehensive research, however, we need to open their detailed Charity Report. The detailed Charity Report lets us review financials to make sure the prospect is in good shape to make a gift; the people on the board of directors so we can understand who the decision makers are; and, most importantly, their entire giving history. There is often a disconnect in the causes a foundation claims to fund in its stated purpose and the causes it funds. For this reason, reviewing giving history as opposed to simply reading a stated purpose or description is critical to successful foundation research. The default view under Gifts returns all gifts the foundation has ever made. You can also use the drop down to view specific years. When reviewing gifts look at the size of the gifts, the categories they give to, and location of the gift recipients. If the foundation is giving in dollar ranges that make sense for you to pursue and to organizations with broadly similar missions to yours, they are well on their way to being a well-qualified prospect. CharityCAN’s interactive gift visualization charts are useful at this stage. The charts quickly show the proportion of gifts going to certain causes and locations. 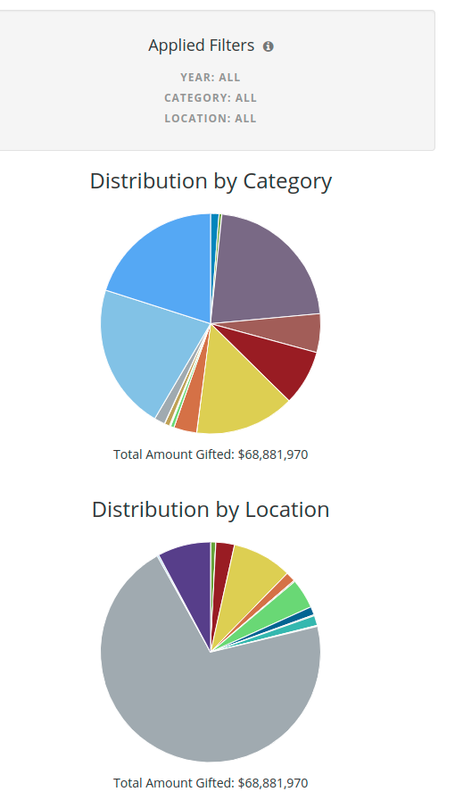 You can also use CharityCAN’s gift visualization charts to drill down even further and determine the total dollar value of gifts to a specific cause, specific location or a specific cause in a specific location. It is worth noting that foundation giving histories can be exported to excel and stored on your local donor management system. CharityCAN does not cap or restrict data exports and almost all data in CharityCAN can be exported. After qualifying a foundation as legitimate prospect, use the Relationship Paths tool to see if your board has any connections to the foundation you can utilize in your approach. Relationship Paths searches our entire Relationship Graph to see if your board has connections to the board of the organization you are researching. In the search displayed below, I found 24 connections the Special Olympics Canada board has to the MLSE Foundation board. When doing a Relationship Path search, it is worthwhile to look some of the other organizations you are connected to. In addition to the MLSE connection, this search also revealed connections to Tim Hortons, Tim Hortons Children’s Charities, The Justin Eves Foundation and RioCan. CharityCAN’s foundation research tools give you the information you need to fundraise more effectively from Canadian granting foundations. Remember: use donation records to identify a new prospect, use the Integrated Search and the Analyst Report to qualify your prospect and then use Relationship Paths to search for connections you have to your prospect! If you have any questions or would like to set up a quick demo of any of the features discussed, please do not hesitate to email us at info@charitycan.ca! Another year has come and gone here at CharityCAN! Longtime CharityCAN users may know that this year was a year of big changes here at our parent company of Third Sector Publishing. At the end of 2017, our founder (and my father) Anderson retired, and I moved from my role of VP Software to full-fledged CEO. With the Canadian Donor’s Guide, the annual reference book for Canadian donors that we used to publish, in the very capable hands of Alison Stoneman, we set about to put all our energy into CharityCAN and move ahead into 2018 as a fully focused software company. Here we are, almost a year later, and thanks to our awesome team and our amazing users, we’ve been able to keep moving forward and make some great improvements to our prospect research and relationship mapping software, with more on the way. As the New Year approaches, you’ll probably be seeing a lot of lists (TV Shows? Podcasts? ), and we thought we could contribute by listing some of the key new features that have appeared on CharityCAN over the past year. We’ve worked hard to make sure you can tie any piece of data from anywhere in CharityCAN into a profile for an individual. Quickly see board positions, donations, relationships, social media information and more with one quick profile view, and create your own profiles that our algorithm missed out on. We launched a new relationship graph engine that allowed us to introduce a new relationship map of an individual’s connections to organizations as well as people. It also gives users the ability to filter any of our relationship maps or relationship path searches so you can customize each search by relationship type, recency and strength. 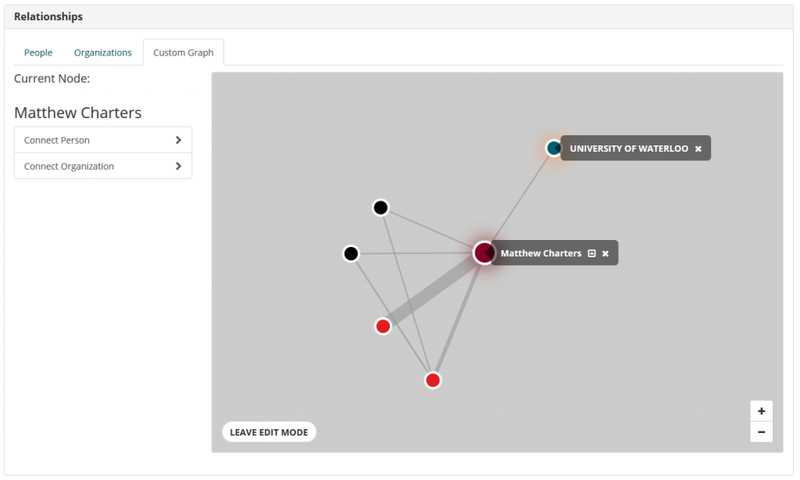 We’ve also started using this graph engine to surface prospects your organization is connected to. When you set a default organization in either our Relationship Paths search or My Prospect Profiles page, we can suggest prospects for you based on their connections to your board. We added two new data sets in 2018: first, comprehensive compensation information thanks to Thomson Reuters for directors and named executive officers of public companies in North America. Secondly, we added FullContact social media data, appending social insights to corporate, charity and individual profiles where available. One of our newest features, we’ve started working on adding some new visualizations to our profiles, starting with donation records on charity and individual giving history. We’re going to continue to look at new and interesting ways to link and present the data in CharityCAN. We have a few ideas about what we’ll be working on in 2019, but our best source of ideas come from you, our users (and potential users!). If you have something you’d like to see in CharityCAN, please get in touch and let us know! We’ve got some of the best customers a company could ask for, and we always love connecting with you. Thanks again to everyone we’ve met along the way this past year. We look forward to meeting new people and forging new relationships in the new year! Today we’re announcing that we’ve supercharged the engine that powers our relationship mapping features. A lot of those changes have happened under the hood here at CharityCAN, and aren’t immediately apparent. While you can’t see some of the differences to the platform yet, we’re also announcing the first of the new features that this new engine enables: the ability to modify a saved profile’s relationship map by adding or removing charity and corporate board positions. On saved profiles that currently have charity boards listed, you can add and remove board positions by hovering over the position you’re interested in: On saved profiles without current board positions, you can now add different profile sections – corporate and charity board positions, as well as a FullContact social media summary: Since our relationship maps are built on these charity and corporate board connections, as you add and remove board positions, you’ll see the saved profile’s relationship map update in real time. The best part about this new relationship graph engine is all the new possibilities that it opens up. We’ve got a few more features that use the new engine in the pipeline that we’re excited to share with you soon! If you have an idea about how you’d like to use our relationship map data, please let us know! This post is on the second of two new features we’re announcing today in CharityCAN. Our first post was all about our new FullContact Data Enrichment that we’ve added to prospect and company profile pages. This post focuses on another exciting new feature: Organization Integrated Search. While we were adding the great new FullContact data to our corporate profile pages, we realized we had a problem: there was no good way to quickly find these company profiles to view the data! They were buried deep within the Corporate Canada search results. To solve the problem, we added a new section to our Integrated Search tool which performs the same kind of Integrated Search you’re used to for individual prospects but for organizational prospects instead. With one search you can see donation records, charity and corporate profiles, and ZoomInfo company search results, all in one place! Just like our Prospect Integrated Search, from each of the results lists above you can export records or dive deeper into an advanced search of any data set. You can find this new search tool by clicking on Integrated Search and then the Organization Search tab. Give it a try and let us know what you think!